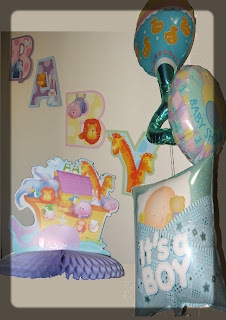 This weekend I experienced one of the rights of passage of new motherhood – a baby shower. It consisted of ten women, cupcakes, some wine and a LOT of laughs! Because I'm a massive control freak I'd already gotten all the games and activities ready weeks ago, much to the disappointment of my best friend who was itching to do it all. But what else is a gal supposed to do when she's finished work and has long days to herself? There is only so many times you can clean the bathroom well enough to eat off every surface (so far I'm up to three times a week). But it made me happy that she could actually participate in the games and have a fun time too. Aunty Penny was the hostess with the most-ess and had everyone introducing each other, getting in to teams, making up team names and ready for action! We had six rounds that ranged from guessing the nursery rhyme from cryptic clues, naming the animal baby, old wives' tales, a general pregnancy quiz (including the best question ever - what is the name of my blog?) and of course the classic 'Guess the contents of the nappy' game. The looks on some of the women's faces as others actually tasted the contents was priceless! The overall winners of the day were my Mum and a friend from my work who called themselves Team Pub (maybe because that's where they'd rather be than in my lounge room sniffing nappies) and like all good parties the prizes were lolly bags. Then it was present opening time! I was so amazed at the generosity of my friends - I am so lucky to be surrounded by such wonderful people. From cute little jumpsuits, a nappy cake to books and toys galore! Tricky is going to be the best dressed, most entertained bub around. Is ur 'best friend' hot? Duz she av a cute 'bum'?